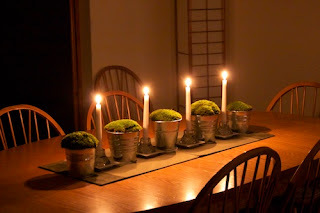 My new tablescape is a contemporary design using moss harvested from a woods walk. I took 5 pails I purchased at Ikea, filled them with potting soil and then mounded thick moss on top. 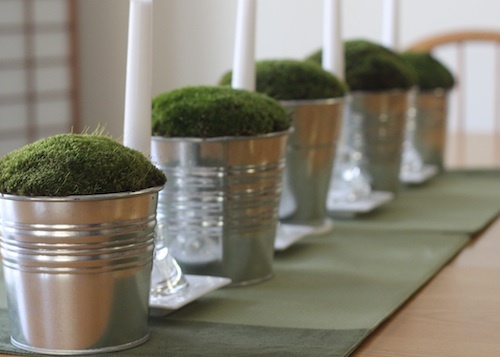 I separated them with white candles placed on my tiny CB2 white square plates and arranged it all on a couple of moss green place-mats. It is a design that is striking by day or evening. It was a very easy DIY project. I referred to this eHow site on growing moss indoors. I mist it daily with water in an effort to keep the moss green and lush for several weeks. So simple and elegant. It makes such a pretty impact! Thanks for commenting. I love the Zen quality. Today I switched it up some. The moss has lasted a very long time (nearly two months and still counting) so it was time for a change. Check out this post with the pin wheel addition. Switched to a country theme for summertime.